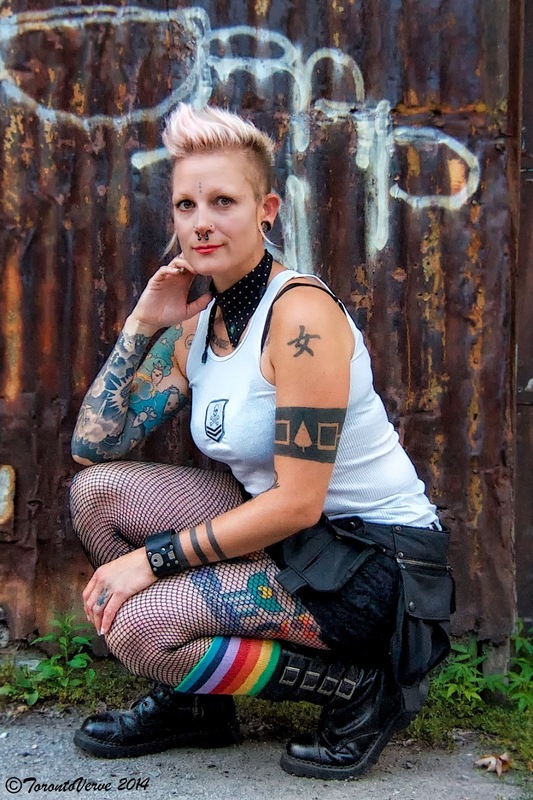 Thea: "My style today is inspired by the comic book movie Tank Girl." TorontoVerve: "That's right -- with Lori Petty. Is there something about that movie that you can relate to?" Thea: "Her (laughs). I love her funky style and tough attitude." 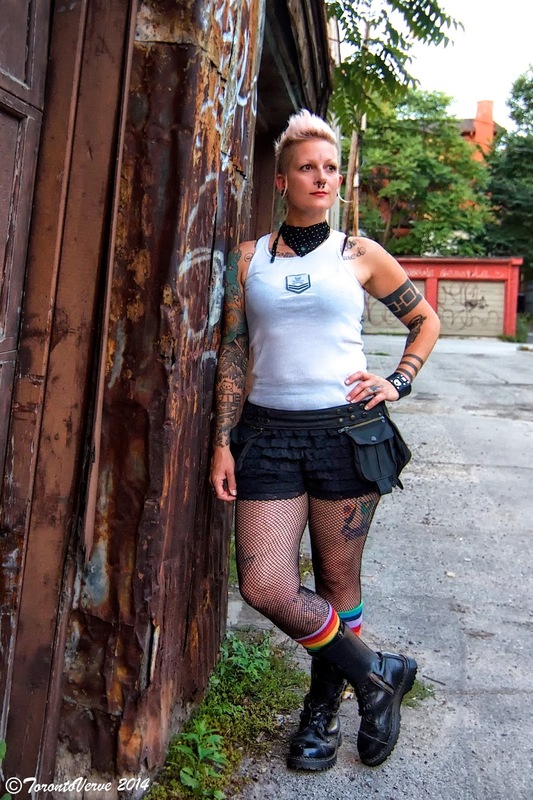 TorontoVerve: "Can you share what your tattoos represent?" Thea: "My left arm is just black. There's no colour. It's almost tribal. This is the Japanese symbol for woman. I always feel like a strong and powerful woman. And just below it is a wampum belt used to symbolize a great birth or great death. My uncle was Mohawk and when he died I had it done. And on my wrist, I have 3 lines because I was born on the third day of the third month." Thea: "My right arm is very colourful, fun and happy. These characters were a design on a toothbrush cup and they made me happy every day when I saw them. This arm has all the things that I love: bunnies, vegetables and milk bottles. Every character has a personality." TorontoVerve previously captured Thea's cool street style earlier this summer in Kensington Market. Thea is DJ Sausy Miso and hosts an internet radio show Wednesday nights from 7pm to 10pm EST on Eve-Radio.com. "I play everything: industrial, noise, witch house and techno." Follow Thea on Instagram and Twitter. Having raised this woman I can honestly say she is strong, creative, genuine and kind. She also happens to be one of my best friends. Did I mention that I love her. 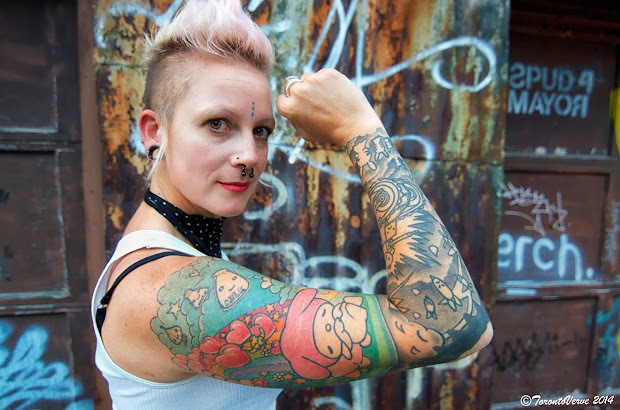 She is gorgeous and fierce - love her style and the inspirations for her ink. Beautiful! Thea is creative and artistic! Like her mom!